If you’re missing one or more teeth and haven’t already considered your tooth replacement options, you really should. Not only can gaps in your smile be distracting or unappealing, but your oral health could be at risk. You could opt for a dental bridge or dentures. But luckily, there’s one option that addresses every problem that losing a tooth presents: dental implants in Louisville. These surgically placed posts become integrated into the jaw bone, restoring the entire tooth from the ground up. As a result, dental implants provide certain advantages that you just don’t get from other restoration options. When a tooth is extracted, the jaw bone is no longer stimulated and begins to lose density. Over time, that can lead to your remaining teeth having less support, endangering their health and stability. When a dental implant is placed into the missing tooth’s socket, it stimulates the jaw bone, which grows to surround the post. Instead of suffering bone density loss, you can strengthen your jaw bone with dental implants. In addition to health in your jaw bone, dental implants are better for your remaining teeth. As another replacement choice, dental bridges rely on the surrounding teeth to anchor and keep the appliance in place. As a result, these teeth often suffer from decay or eventually need to be removed as well. 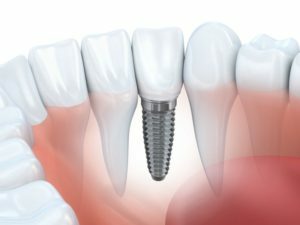 Unlike dental bridges, implants stand independent from other teeth and don’t impact their health. Dentures are secured using suction or metal clasps for convenient maintenance, but this also can lead to mishaps or awkward situations if they slip or come loose. Because dental implants become well integrated into the jaw bone, they are exceptionally strong and stable. They can withstand the wear and tear you put them through, so you can bite, chew, speak, and eat with absolute confidence in your teeth. Dental implants can be used for more than just one missing tooth at a time. In fact, dental implants can be combined with the other restoration options to give you every advantage out there. For example, for multiple missing teeth in a row, you could use a dental bridge that is anchored to dental implants instead of natural teeth. Dental implants can last for thirty years or even longer with the proper care. Although dental implants cost the most upfront out of all the restoration options, you may never need to replace the dental implant. Because of the changes that can occur to your facial structure over time, dentures need to be changed out about every five to seven years, and dental bridges tend to last about seven to ten years. When you add up the costs over the long term, dental implants may be the most affordable option. All the advantages that dental implants bring to the table far outweigh any drawbacks. The health and function of your smile are worth preserving and protecting. You could enjoy your fully restored, happy, healthy smile for many years to come with this restoration option. To determine if dental implants are right for you and get started, contact your dentist in Louisville. First opened in 1966, Remmers Dental has always been committed to meeting each patient’s individual needs. The three dentists and their staff have years of dental experience and are able to place dental implants and handle your tooth restoration in-house. In fact, Dr. Stephen Remmers is an active member of the American Academy of Implant Dentistry. To schedule an appointment, call (502) 499-0234 or click here.